I used this photo earlier on this blog, but love it so much, I’m posting it again. 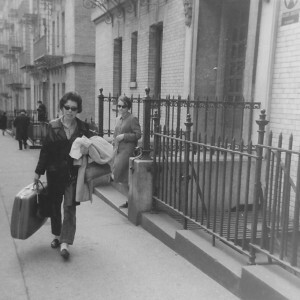 My mom was visiting her friend Carol, the woman coming out of this Manhattan building, in 1964. Sometime after this photo was taken, my mom moved to Japan to teach math and science. Now my mom is sailing on the Pacific Ocean, somewhere between Hawaii and Vancouver. These days she’s traveling as much as she did back when this photo was taken.